Infrared thermography (IRT), thermal imaging, and thermal video are examples of infraredimaging science. Thermographic cameras detectradiation in the infrared range of the electromagnetic spectrum (roughly 9,000–14,000 nanometers or 9–14 µm) and produce images of that radiation, called thermograms. Since infrared radiation is emitted by all objects above absolute zero according to the black bodyradiation law, thermography makes it possible to see one's environment with or without visible illumination. The amount of radiation emitted by an object increases with temperature; therefore, thermography allows one to see variations in temperature. 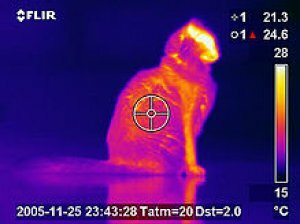 When viewed through a thermal imaging camera, warm objects stand out well against cooler backgrounds; humans and other warm-blooded animals become easily visible against the environment, day or night. As a result, thermography is particularly useful to military and other users of surveillance cameras. Compact Thermal Camera for Building Diagnostics and Predictive Maintenance Excellent Screen Size and Quality – High-resolution color 2.8” LCD display helps find problems fast Accurate Results – thermal accuracy (+/-2%) and broad measurement range (-20°C to 250°C) give you results you can count on. Rugged, Compact Design – Easy to use, one-handed operation with a focus-free lens; tough enough to withstand a two meter drop and stow with the rest of your tools. Fully Radiometric Images – Store up to 5,000 JPEG image files with all temperature measurements right in the camera for future analysis, downloads, and custom reports. Plenty of Extras – Includes PC reporting software, plenty of memory with a 2 GB microSD card, and comes complete with a hard carrying case. Unmatched Warranty – Double Diamond warranty covers whole camera for 2 years, the battery for 5 years, and the detector for 10 years. Infrared thermal imaging temperature \ Security \ Quick \ Temperature Warning System Rapid detection of human body temperature passing through. Stopping is not necessary. Connection monitoring functions : Instantly synchronized display of the thermal imager like the picture on the PC screen . When the thermal imager to detect more than a high temperature : with two different warning sound , you can set the body fever warning sound and warning sound outside fever over the body ( such as hot coffee and hot food ... etc) . Flashing red warning , digital temperature display characters , a warning sound from the PC speaker . Thermal imaging screen automatically according to date for the file name is automatically saved every minute JPG files.